From its inception in 1998, (mt) Media Temple has been on a mission to help people and businesses succeed online. Over 125,000 customers in 100 countries now rely on Media Temple's simple tools for domain registration, web hosting, business applications, virtual servers, and other cloud services to power more than 1.5 million websites. The company takes pride in offering a premium service at a competitive price, along with exemplary 24/7 customer support. 24/7 Support: US-based support staff are available 24/7/365 by online chat, Twitter, and phone. Extended support options from Media Temple’s new CloudTech Premium Support service are also available. Easy to Use Plesk Control Panel: Plesk 11 makes server management fast and easy. Quickly view web stats, install applications, manage databases, create email addresses, and more. Powerful Re-seller features: Easy subscription creation, separate control panels, a free billing application, and resource management tools are all included, so you can easily resell your (mt) hosting service to your own clients. Total Customization: The latest versions of PHP, MySQL, Perl, Python, Ruby, and more come pre-installed. 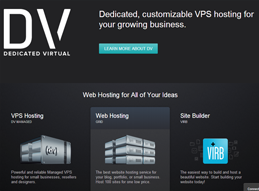 But you can customize your server with any Linux-based application, server software, or OS component. Scalable Resources: DV Managed accounts can be instantly scaled up or down through six different levels of service, from 1GB of RAM up to 32GB, with the click of a button.